These crocodiles were living in an enclosed lagoon at the Kaleta Reserve near Amboasary in southern Madagascar. The Nile Crocodile (Crocodylus niloticus) is an African crocodile which is common in Somalia, Ethiopia, Uganda, Kenya, Egypt, Zambia and Zimbabwe. In antiquity, Nile crocodiles occurred in the Nile delta and the Zarqa River (Jordan), and they are recorded by Herodotus to have inhabited Lake Moeris. They are thought to have become extinct in the Seychelles in the early 19th century. It is known from fossil remains that they once inhabited Lake Edward. The Nile crocodile's current range of distribution extends from the Senegal River, Lake Chad, Wadai and the Sudan to the Cunene and the Okavango Delta. In Madagascar, crocodiles occur in the western and southern parts from Sembirano to Port Dauphin. They have occasionally been spotted in Zanzibar and the Comoros. Until recently, many permanent waters in the Sahara still housed relict populations. In West Africa, Nile crocodiles are found most frequently in coastal lagoons, estuaries, and in the rivers bordering the equatorial forest belt. In East Africa, they are found mostly in rivers, lakes, marshes, and dams. They have been known to enter the sea in some areas, with one specimen having been seen 11 km off St Lucia Bay in 1917. In Madagascar, they have adapted to living in caves. Nile Crocodiles have a dark bronze colouration above, with black spots on the back and a dirty purple on the belly. The flanks, which are yellowish green in colour, have dark patches arranged in oblique stripes. There is some variation relative to environment; specimens from swift flowing waters tend to be lighter in colour than those dwelling in lakes or swamps. They have green eyes. Like all crocodiles, they are quadrupeds with four short, splayed legs; long, powerful tails; a scaly hide with rows of ossified scutes running down their back and tail; and powerful jaws. They have nictitating membranes to protect their eyes and have lachrymal glands, and can cleanse their eyes with tears. Nostrils, eyes, and ears are situated on the tops of their head, so the rest of the body can remain concealed underwater. Their coloration also helps them hide: Juveniles are grey, multicoloured, or brown; with darker cross-bands on their tail and body. As they mature they become darker and the cross-bands fade, especially those on the body. The underbelly is yellowish, and makes high-quality leather. They normally crawl along on their bellies, but they can also "high walk" with their trunks raised above the ground. Smaller specimens can gallop, and even larger crocodiles are capable of surprising bursts of speeds, briefly reaching up to 12 to 14 km/h (7.5 to 8.5 mi/h). They can swim much faster by moving their body and tail in a sinuous fashion, and they can sustain this form of movement much longer at about 30 to 35 km/h (18 to 22 mi/h). They have a three-chambered heart which is often mistaken as four-chambered due to an elongated cardiac septum, which is physiologically similar to the four chambered heart of a bird, which is especially efficient at oxygenating their blood. They normally dive for only a couple of minutes, but will stay underwater for up to 30 minutes if threatened, and if they remain inactive they can hold their breath for up to 2 hours. They have an ectothermic metabolism, so they can survive a long time between meals — though when they do eat, they can eat up to half their body weight at a time. They have a rich vocal range, and good hearing. Their skin has a number of poorly-understood integumentary sense organs (ISOs), that may react to changes in water pressure. 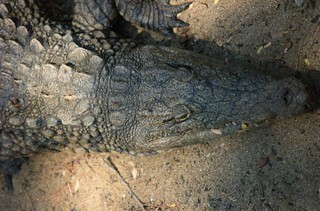 The bite force exerted by an adult Nile crocodile has been shown by Dr Brady Barr to measure 5,000 lbf (22 kN). However, the muscles responsible for opening the mouth are exceptionally weak, allowing a man to easily hold them shut with a small amount of force. Their mouths are filled with a total of 64 to 68 cone-shaped teeth. On each side of the mouth, there are 5 teeth in the front of the upper jaw (the premaxilla), 13 or 14 in the rest of the upper jaw (the maxilla), and 14 or 15 on either side of the lower jaw (the mandible). Hatchlings quickly lose a hardened piece of skin on the top of their mouth called the egg tooth, which they use to break through their egg's shell at birth. Outside water crocodiles can meet concurrence with other dominant Savanna predators, notably felines such as lions and leopards. Occasionally, both will hunt and prey on each other, depending on size, if regular food becomes scarce. From the 1940s to the 1960s, the Nile crocodile was hunted, primarily for high-quality leather, though also for meat and purported curative properties. The population was severely depleted, and the species faced extinction. National laws, and international trade regulations have resulted in a resurgence in many areas, and the species as a whole is no longer threatened with extinction. Crocodile 'protection programs' are artificial environments where crocodiles exist safely and without the threat of extermination from hunters. There are an estimated 250,000 to 500,000 individuals in the wild. The Nile crocodile is also widely distributed, with strong, documented populations in many countries in east and southern Africa, including Somalia, Ethiopia, Kenya, Zambia and Zimbabwe. Successful sustainable-yield programs focused on ranching crocodiles for their skins have been successfully implemented in this area, and even countries with quotas are moving toward ranching. In 1993, 80,000 Nile crocodile skins were produced, the majority from ranches in Zimbabwe and South Africa. The situation is more grim in central and west Africa, which make up about two-thirds of the Nile crocodile's habitat. The crocodile population in this area is much more sparse, and has not been adequately surveyed. While the natural population of Nile crocodiles in these areas may be lower due to a less-than-ideal environment and competition with sympatric slender-snouted and dwarf crocodiles, extirpation may be a serious threat in some of these areas. Additional factors are a loss of wetland habitats, and hunting in the 1970s. Additional ecological surveys and establishing management programs are necessary to resolve this. The Nile crocodile is the top predator in its environment, and is responsible for checking the population of species like the barbel catfish, a predator that can overeat fish populations that other species, like birds, depend on. The Nile crocodile also consumes dead animals that would otherwise pollute the waters. The primary threat to Nile crocodiles, in turn, are humans. While illegal poaching is no longer a problem, they are threatened by pollution, hunting, and accidental entanglement in fishing nets. Much of the hunting stems from their reputation as a man-eater, which is not entirely unjustified. 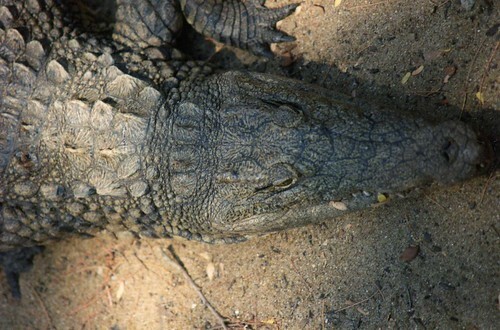 Unlike other "man-eating" crocodiles, like the salties, the Nile crocodile lives in close proximity to human populations, so contact is more frequent. While there are no solid numbers, the Nile crocodile probably kills a couple of hundred people a year, which is more than all the other crocodiles combined. Some estimates put the number of annual victims in the thousands. The Conservation Status of the Nile crocodile under the 1996 World Conservation Union (IUCN) Red List is "Lower Risk" (Lrlc). The Convention on International Trade in Endangered Species of Wild Fauna and Flora (CITES) lists the Nile crocodile under Appendix I (threatened with extinction) in most of its range; and under Appendix II (not threatened, but trade must be controlled) in the remainder, which either allows ranching or sets an annual quota of skins taken from the wild.